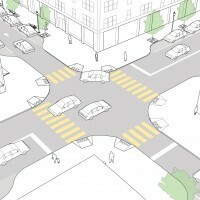 Designers should take into account both existing as well as projected crossing demand. Frequent crossings reinforce walkability and have the potential to fuel greater demand. As traffic speeds and volumes increase, so too does the level of protection desired by pedestrians. Where vehicle speeds and volumes are high and pedestrian access is expected at regular intervals, signalized crossings preserve a safe walking environment. 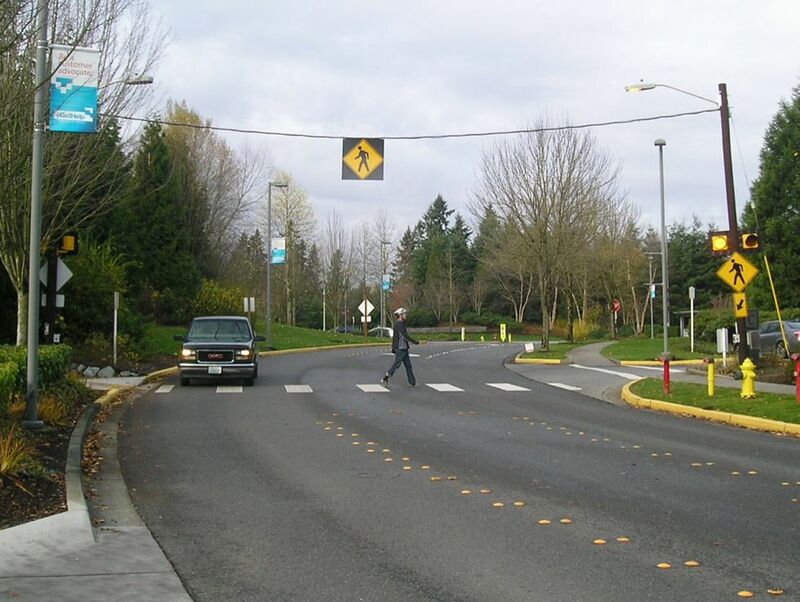 Where anticipated pedestrian traffic is low or intermittent, or where vehicle volumes are lower and pedestrian crossings shorter, designers may consider the use of unsignalized crossing treatments such as medians, hybrid or rapid flash beacons, or raised crossings. On streets with low volume (<3000 ADT), low speeds (<20 mph), and few lanes (1–2), marked crosswalks are not always necessary at the intersections. 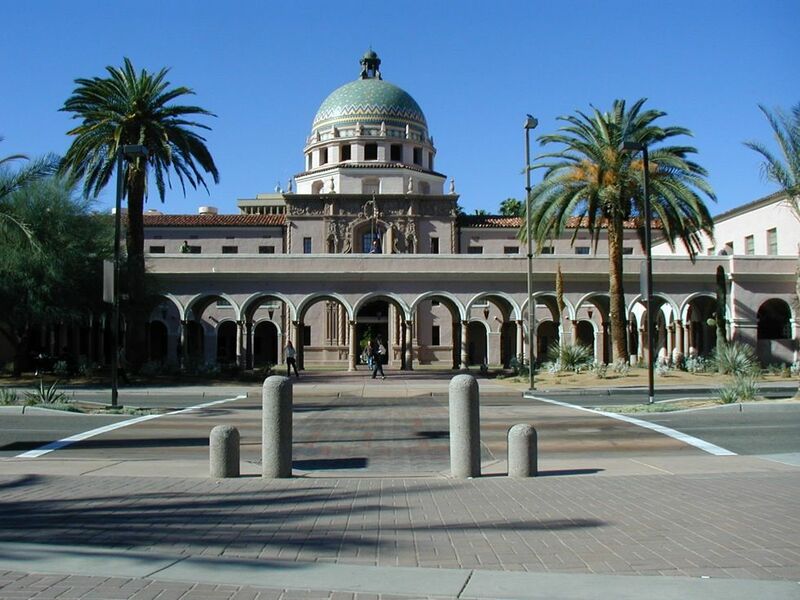 At schools, parks, plazas, senior centers, transit stops, hospitals, campuses, and major public buildings, marked crosswalks may be beneficial regardless of traffic conditions. On streets with higher volume (>3000 ADT), higher speeds (>20 mph), or more lanes (2+), crosswalks should be the norm at intersections. Designers should take into account both existing as well as projected crossing demand. Frequent crossings reinforce walkability and have the potential to fuel greater demand. Where signalized or stop-controlled pedestrian crossings are not warranted but demand exists or is anticipated, designers should continue to work toward goals of safety and comfort for people walking through other means, such as actuated crossings or enhanced crossing treatments. For more information on travel demand forecasting for pedestrians, see "Pedestrians in Regional Travel Demand Forecasting Models: State-of-the-Practice" Patrick Singleton and Kelly Clifton, 2012. Judgment on the application of a crosswalk should be based on multiple factors, including land uses, present and future demand, pedestrian compliance, speed, safety, and crash history. Volumes alone are not enough to determine whether or not a particular device should be used. Application of the Pedestrian Volume Warrant (MUTCD 4C.05) should be considered alongside multiple factors, including future land uses, projected pedestrian volumes, and built environment factors. Minimum spacing criteria of 300 feet may not be adequate in all cases and should be evaluated on the basis of the pre-existing street network as well as foreseen crossing demand. The presence of a crosswalk does not in and of itself render a street safe. Based on their surrounding context, speed, and overall roadway width, crosswalks often require additional safety measures such as safety islands, signals, or traffic calming. 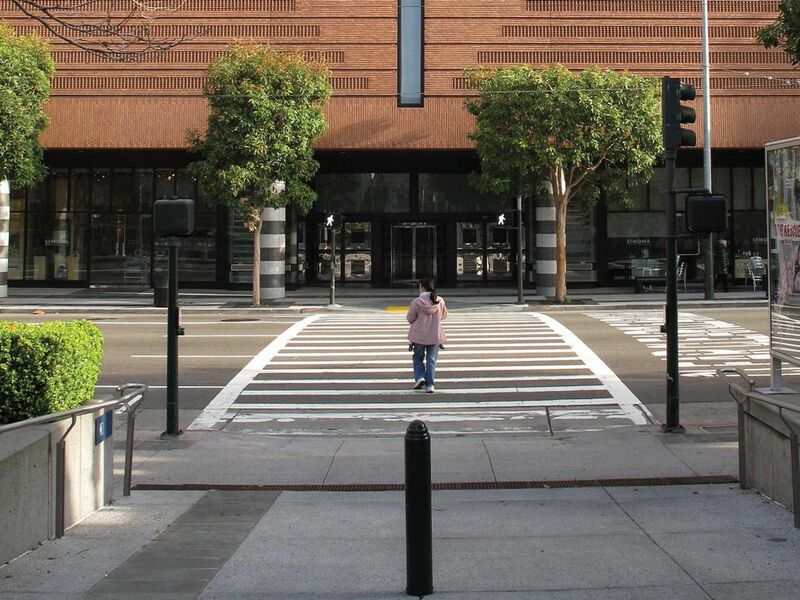 While pedestrians generally have the right to cross at any intersection regardless of crosswalks, designers should be sensitive to the misperception that a crosswalk is the only legal place to cross the street. Use crosswalks as both a guide for pedestrians and a way to communicate crossings to motorists. The practice of discouraging pedestrian crossings by leaving uncontrolled crossings unmarked is not a valid safety measure. 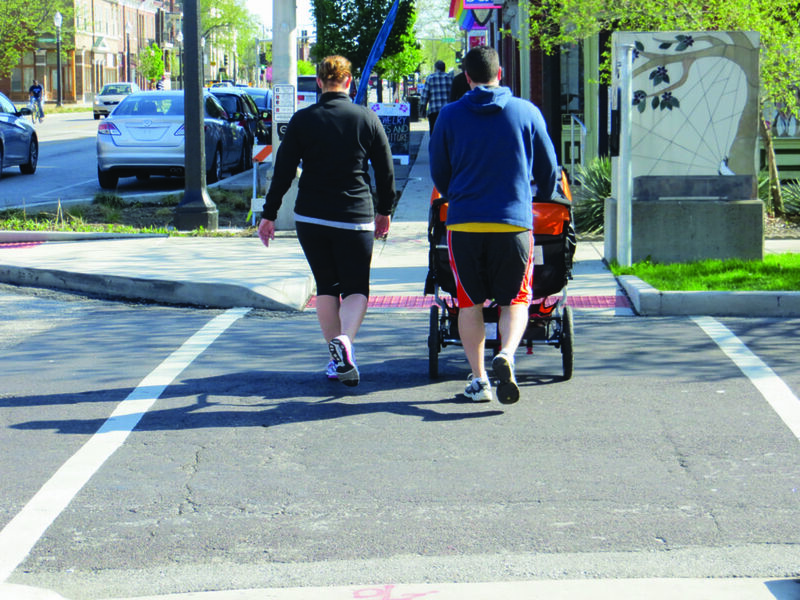 Instead, it encourages unsafe, risk-taking behavior and discourages walking citywide. Efforts should be made to enhance or highlight desired crossings wherever practicable. 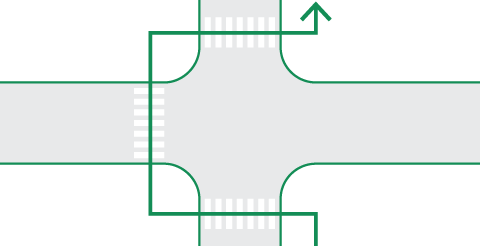 Hybrid beacons, rapid flash beacons, raised crossings, medians, and other safety counter-measures may be suitable and less expensive than full signalization. These should all be considered before leaving an uncontrolled crossing unmarked. All legs of signalized intersections must have marked crosswalks unless pedestrians are prohibited from the roadway or section thereof, or if there is physically no pedestrian access on either corner and no likelihood that access can be provided. Pedestrians are unlikely to comply with a 3-stage crossing and may place themselves in a dangerous situation as a result. NO PEDESTRIANS (MUTCD 2B.36, R5-10c, or R9-3a) signs should not be used unless they are accompanied by a physical barrier and positive information about where pedestrians should cross the street. Pedestrian countdown signals create a more predictable crossing environment and give adequate warning to pedestrians attempting to cross a roadway. All new crosswalk signals should include pedestrian signals with countdowns. Pedestrian crossings should be at grade except in instances where they are crossing limited access highways. Pedestrian overpasses and underpasses pose security risks from crime and are frequently avoided for a more direct (if less safe) crossing. Crosswalk spacing criteria should be determined according to the pedestrian network, built environment, and observed desire lines. In general, if it takes a person more than 3 minutes to walk to a crosswalk, wait to cross the street, and then resume his or her journey, he or she may decide to cross along a more direct, but unsafe or unprotected, route. While this behavior depends heavily on the speed and volume of motorists, it is imperative to understand crossing behaviors from a pedestrian’s perspective. 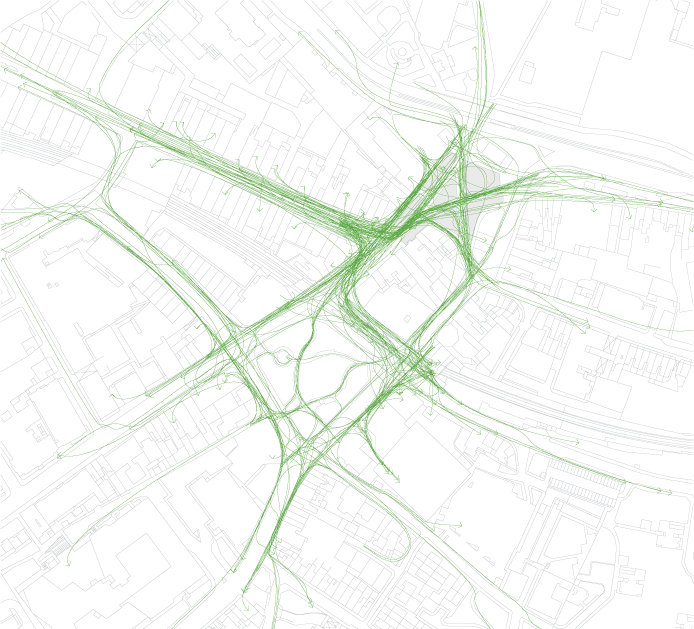 Map the pedestrian network and crossing locations to understand how it corresponds to the bicycle, transit, and vehicle networks. Pedestrians interact with the environment at a fine grained level and have frequent demand for accessing destinations. Locate pedestrian crossings as per current or projected pedestrian desire lines. Balance their placement with that of the motorized traffic network, so as to not severely compromise either. There is no absolute rule for crosswalk spacing. 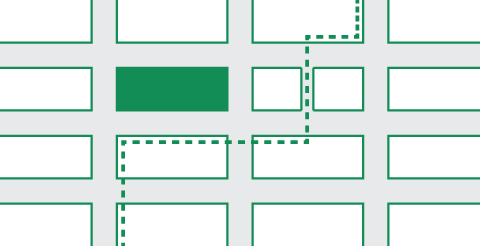 Rather it depends on block length, street width, building entrances, traffic signals, etc. 120-200' has been shown to be sufficient. Signalized crosswalks are permitted at all intersections where they are deemed necessary by current or projected conditions, with input from professional judgment, regardless of existing warrants (MUTCD 2009, Section 4C.05, Paragraph 04). They should typically be permitted at a minimum of 200 foot spacing (or approximately one short city block). Unsignalized crosswalks may be provided at closer intervals. Many older downtown grids, including those in Portland (OR), Houston, Sacramento, and New York, have block sizes under 300 feet (on at least one side). While signals are not required at each block, most cities need the option to signalize consecutive intersections under 300 feet. Pedestrians, including elderly and disabled persons, should be able to cross an intersection in a single cycle, rather than two cycles, unless a street is segmented by a transit, bus, or other destination median. Channelized turning “porkchop” islands are not recommended and should be avoided. Turning traffic often fails to yield to pedestrians crossing at these locations. References for Crosswalks and Crossings: 17 found. Nitzburg, Marsha, & Richard L Knoblauch. 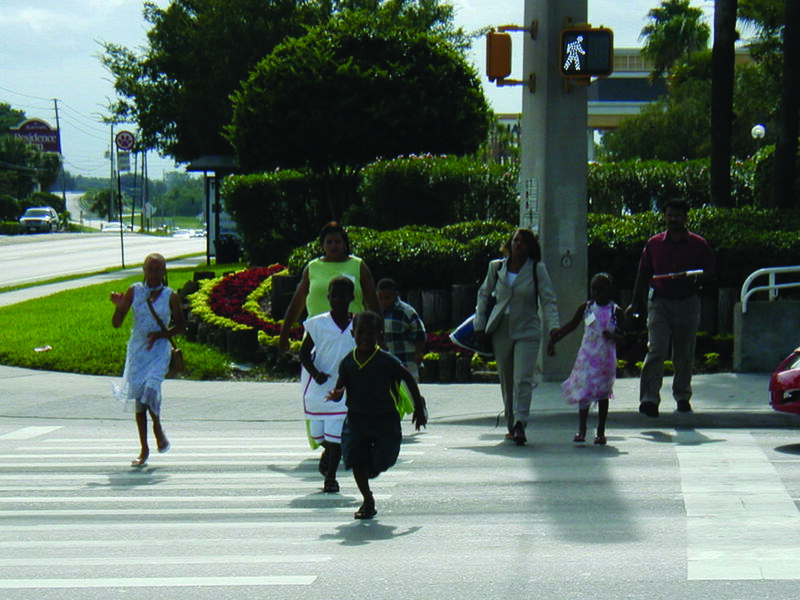 "An Evaluation of High-Visibility Crosswalk Treatments-Clearwater, Florida." Federal Highway Administration Report FHWA-RD-00-105, 1-21, US Department of Transportation, Washington, DC. McGrane, Ann, and Meghan Mitman. "An Overview and Recommendations of High-Visibility Crosswalk Markings Styles." Federal Highway Administration Report DTFHGI-11-H-00024 1-4, US Department of Transportation, Washington, DC. Toole Design Group. 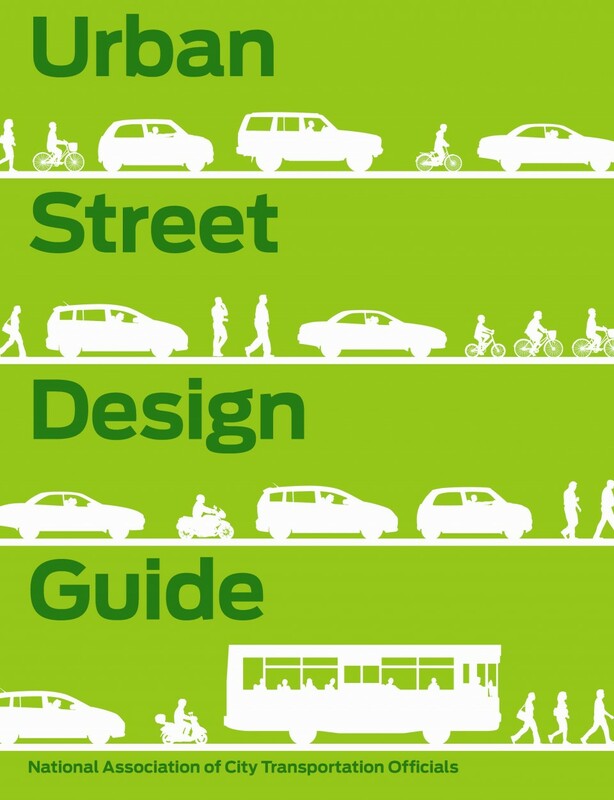 "Boston Complete Streets Design Guide: Crosswalk Design." Boston Transportation Department, City of Boston, Boston, MA. Fox Tuttle Transportation Group. "Pedestrian Crossing Treatment Installation Guidelines." Transportation Division, City of Boulder, Boudler, CO.
Branyan, George. "DC Experience with the HAWK-Hybrid Pedestrian Signal and Rectangular Rapid Flashing Beacons." District Department of Transportation, District Department of Transportation, Washington, DC. Dougald, Lance E. "Development of Guidelines for the Installation of Marked Crosswalks." Virginia Transportation Research Council , Virginia Department of Transportation & University of Virginia, Charlottesville, VA.
Mitman, Meghan Fehlig, Doug Cooper, Brooke DuBose, & Swati Pande. "Driver/Pedestrian Behavior at Marked and Unmarked Crosswalks in the Tahoe Basin." California Path Program, Institute of Transportation Studies, University of California, Berkeley, CA. Zegeer, Charles V, Richard Blomberg, David Henderson, Scott Masten, Lauren Marchetti, Marvin M Levy, Yingling Fan, et al. "Evaluation of Miami-Dade Pedestrian Safety Demonstration Project." Journal of the Transportation Research Board 2073, (1), 1-10, Transportation Research Board, Washington, DC. Fitzpatrick, Kay, Susan T Chrysler, Ron Van Houten, William W. Hunter, & Shawn Turner. "Evaluation of Pedestrian and Bicycle Engineering Countermeasures: Rectangular Rapid-Flashing Beacons, HAWKs, Sharrows, Crosswalk Markings, and the Development of an Evaluation Methods Report." Texas Transportation Institute, Office of Safety Research and Development, Federal Highway Administration, McLean, VA.
Hunter, William W, Raghavan Srinivasan, & Carol A Martell. "Evaluation of Rectangular Rapid Flash Beacon at Pinellas Trail Crossing in St. Petersburg, Florida." Transportation Research Record 2314 (1), 7-13, Transportation Research Board, Washington, DC. Turner, Shawn, Laura Sandt, Jennifer Toole, Robert Benz, & Robert Patten. "Federal Highway Administration University Course on Bicycle and Pedestrian Transportation, Lesson 12: Midblock Crossings." Pedestrian and Bicycle Safety Section, Federal Highway Administration, Washington, DC. CTC and Associated, LLC. "HAWK Pedestrian Signals: A Survey of National Guidance, State Practice and Related Research." Bureau of Highway Operations, Wisconsin Department of Transportation, Madison, WI. Fitzpatrick, Kay, Shawn Turner, Marcus A Brewer, Paul Carlson, Brooke Ullman, Nada Trout, Eun Sug Park, Jeff Whitacre, Nazir Lalani, & Dominique Lord. 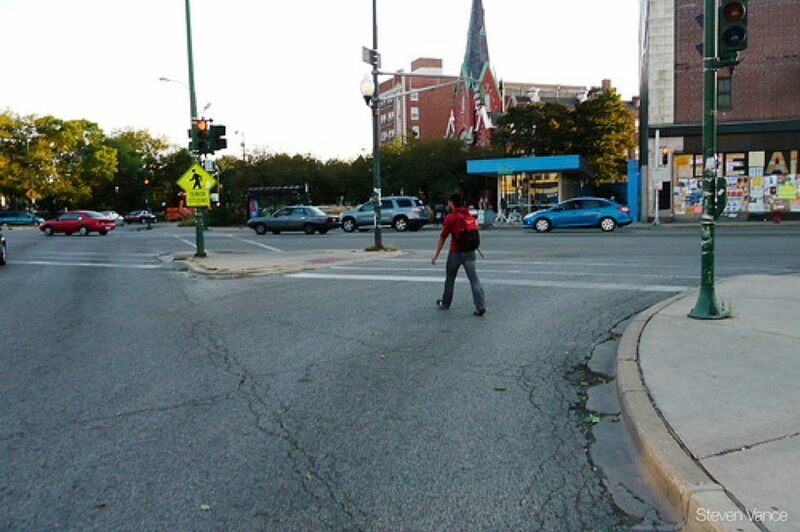 "Improving Pedestrian Safety at Unsignalized Intersections." Texas Transportation Institute, Transportation Research Board, Washington, DC. Gibbons, Ronald B, Chris Edwards, Brian Williams, & Carl K Andersen. 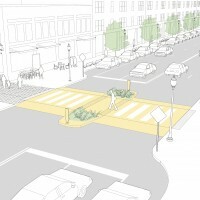 "Informational Report on Lighting Design for Midblock Crosswalks." Virginia Tech Transportation Institute , Office of Safety Research and Development, Federal Highway Administration, McLean, VA.
Lu, George (Xiao-Zhao) and David A Noyce. "Pedestrian Crossings at Mid-Block Locations: A Fuzzy Logic Solution for Existing Signal Operations." Prepared for the 88th Annual Meeting of the Transportation Research Board, Transportation Research Board, Washington, DC. Nabors, Dan, Robert Schneider, Dalia Level, Kimberly Lieberman, & Colleen Mitchell. "Pedestrian Safety Guide for Transit Agencies." Federal Highway Administration Report FHWA-SA-07-017, 1-68, US Department of Transportation, Washington, DC.